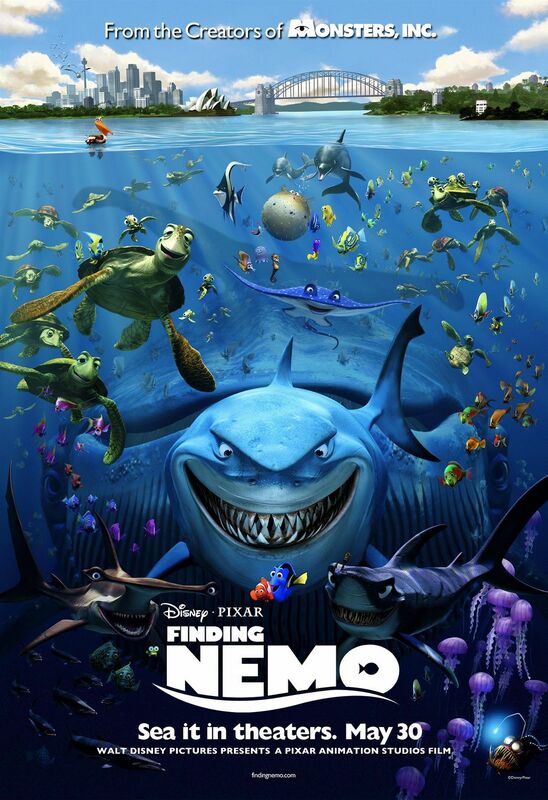 One of the most entertaining movies ever made, Finding Nemo excels in blending witty comedy, human emotions and fast-paced adventures with fish as its unlikely heroes. On every level, on every repeat, the movie continues to be a delightful adventure. At the heart of the story is Marlin (Albert Brooks), an overprotective clownfish having suffered a major trauma in the movie’s grim opening scenes. When his only son Nemo (Alexander Gould) goes off to school and is captured by divers, Marlin goes on a search mission to rescue his son. The relatively simple set up works admirably with action embodying the characters inner turmoils vividly. By the time Marlin and Nemo square off, right before the latter is captured, both sides of their argument have been established. The movie only gets more entertaining from here on out, but never loses its connection to the emotional stakes of a father whose son is all he has left and a boy who wants to do things himself. With the introduction of Dory, Andrew Stanton and his team show off a skill very few posses; the perfection of character introduction. Lead characters who are introduced right away can ride the audience’s good will of going along with their story, but newly introduced players always have to prove their value. Dory, in theory, is a tough sell. An energised fast-talker with short-term memory loss. It’s through the charm of Ellen DeGeneres and the fun challenges her condition brings, that Dory is so likeable that she earned herself a sequel. From the second she arrives, the movie is lit up with funny banter and unpredictable excitement, as Dory serves as the polar-opposite of the controlling and cautious Marlin. Their adventures, on their own already thrilling and original, are increasingly goofy and captivating as the platonic relationship develops and deepens. In its essence, Finding Nemo is a road-trip movie, and one that takes full advantage of its vast setting. From the Great Barrier Reef to the Sydney Harbour, Marlin and Dory encounter the most diverse characters in a wide range of locations with each a more thrilling trial than the one before. It’s also in such a rapid pace that none of the episodes feel like stalling, instead taking only the best of each situation before moving to the next, educating the character of Marlin along the way. Similarly, the string of adventures is cut up with Nemo’s story inside a fish tank. The most literal side-plot ever also has a group of memorable characters, but is wisely contained to the tank opposed to the entire ocean of the main story. The rare moments, when the two cross over, such as when Marlins story is passed along by all creatures in and around the sea, are all the more exciting because of the inevitable reunion. The scope might be a huge chunk of ocean, but Stanton keeps its climax small by changing up the dynamics and letting the characters and their experiences along the way play out. If nothing else, Finding Nemo is a masterclass in the economy of a rich story. Where the wonderful world of the sea really finds its purpose is in the animation. Ignoring any preconception of fish as protagonists, Pixar certainly breathes life into those slick, shiny, glazing eyes. In every close up, the scales glisten in detail, in every wide shot, the infinite blue engulfs the action. Even after a decade, the animation of the underwater world looks better on a big screen than any movie that takes place on dry land. Adding the explosion of colours, the array of different creatures and the simple pleasure of animated water, and Finding Nemo amazes and fascinates with every frame. It’s one of those movies where pausing at any moment likely serves up a stunning wallpaper. The remarkable bonus of the movie is the humor. Truly, once the dramatic set-up is ensured, the movie is a full on comedy. New characters are deliciously ridiculous or satirical contradictions, with the vegetarian sharks as a memorable stroke of genius. Likewise, the two clownfish are the least funny, but are surrounded by either quick-wit, visual slapstick or simple silly comedy. No beat is wasted so there’s bound to be a joke for everyone in here, cementing that even when animation is most attractive for kids, it doesn’t have to be boring for anyone. Finding Nemo is now as exciting and gorgeous as it ever was. Its father/son concept still plays on the heart-strings with an emotional set-up and riveting sequences for valuable lessons learned. With contineous comedy and a large cast of noteworthy individuals, the story never slows down. In this colourful, adventurous sea of a movie, anybody would happily get lost.